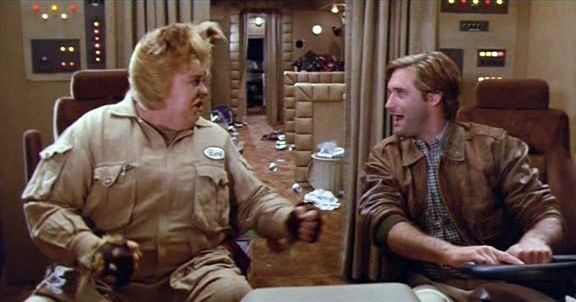 Lone Starr is the Winnebago flying protagonist in Mel Brooks' "Spaceballs". Accompanied by his furry friend, Barf, a space dog/man, Lone Starr and Barf are a direct parody of George Lucas' Star Wars characters Han Solo and Chewbacca. At the beginning of the film Lone Starr is a ruthless, care only for himself, space cowboy. But during the film's narrative he goes through a character transformation and becomes a hero, lover, and wielder of the Schwartz.